My dad's bike is a 2001 750. Having trouble starting the bike and noticed the rear cylinder is cold and front hot. 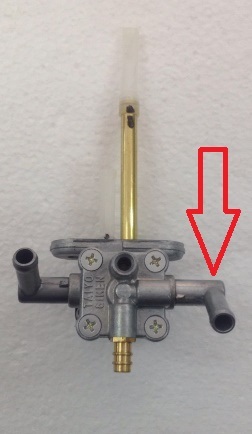 I noticed that the fuel line running to the rear is completely kinked at the fuel tap petcock valve. Not sure how it happened, but the hose barb is facing the wrong way (outward away from the bike). How would I go about turning it back in place without breaking it? On ours, it is facing the other way. The hose barbs are just pressed into the petcock body. You can very carefully rotate them with a pair of piers or needle-nose pliers, spread the load evenly to avoid breaking the barb. When you route the hoses, make sure the hoses are level or running downhill toward the carbs. Loops and uphill sections will decrease fuel flow. as far as the hoses..
1 from gas tank (fitting at bottom of tank near your crotch) is the vent hose. it runs to the middle of the bike, then down and ends in free air at or below frame level. 3 from front of bike, there will be one from right front 'ear' (air filter housing) to the 2 carb vent lines that T together. also, there is one from the bottom of the airbox at front of bike that is the drain for condensation or oil vapor condensation and just goes down low on bike. ONLY ones that have connection to anything on the bike are the one from thermostat housing to reservoir, and the carb vent line. Crankcase vent is also at the front. Larger hose, maybe 1/2" diameter, connects to the airbox. Thanks Spockster and michiganteddybear. The hoses all seem in order and the fuel line is unkinked. We must have tweeked it when moving the gas tank. My dad was having overheating problems, so we completely drained the coolant, took off the radiator and flushed it, filled everything up with distilled water. Currently waiting for it to cool back down to see how it looks. It ran really nicely though. The initial coolant that we drained was mostly brown and reeked of urine. My dad was given this bike by his brother after my dad's '87 drowned in hurricane Sandy. My uncle took it to the dealership for service right before giving it to him. It ran like garbage though. Wrong spark plugs were put in and were improperly gapped (not even close), wasn't charging and now the urine coolant. I'm guessing someone at the dealership was pissed off about something (they wound up shutting down shortly afterward). Hopefully he has some trouble free miles ahead.